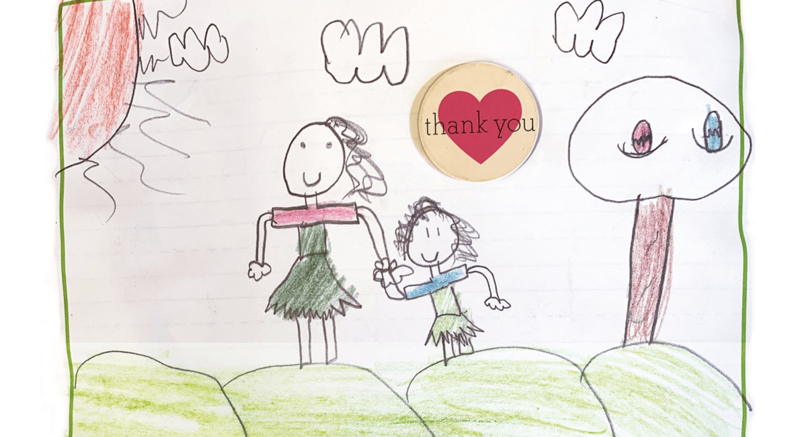 A young girl sketched a thank you note to Sinai Health staff for helping her control her asthma. Her inhaler was always nearby in case she had an asthma attack, resting by her pillow every night. 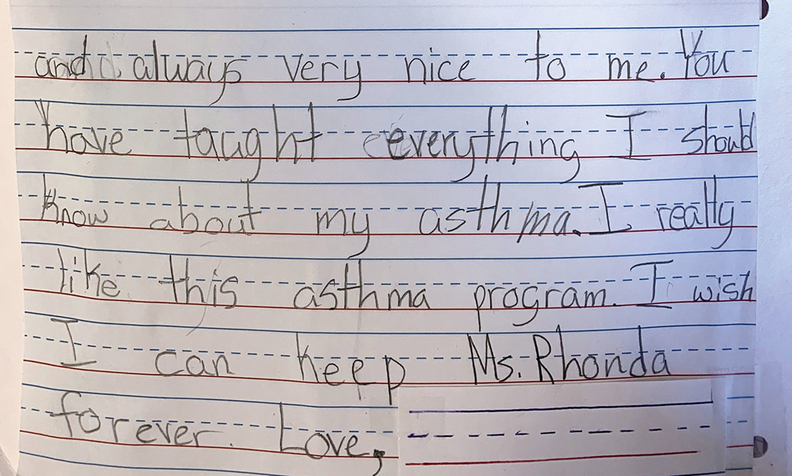 Asthma was holding the fifth-grader back in school, putting her aspirations to be a writer and an artist further out of reach. Multiple visits to the emergency room took her away from schoolwork. She embodied a statistic compiled by Sinai Health System's Urban Health Institute: Nearly 1 in 4 kids in Chicago's West Side community of North Lawndale suffers from the chronic respiratory disease. The institute, which works to address health disparities in some of the area's most vulnerable neighborhoods, turned to its Helping Children Breathe and Thrive in Chicago's Public Housing program to help. “It gave the young girl confidence to be the author of her own life,” said Sharon Homan, president of the Sinai Urban Health Institute. Mount Sinai Hospital Medical Center—a safety-net hospital on Chicago's West Side—points to these and other community benefit programs as evidence of its effort to combat the underlying factors that impact a person's health. Kids who participated in the Helping Children Breathe and Thrive program saw their asthma-related symptoms decrease about 81% during the daytime. That helped reduce ER visits by 83% and cut hospitalizations in half. “If people don't have a safe and reliable place to live, a steady paycheck or know where they are going to get food, they are not going to care about going in for a prostate screening,” said Karen Teitelbaum, CEO of Sinai Health System. Yet, the context of these programs is missing from Mount Sinai's Form 990, which the Internal Revenue Service requires of not-for-profit tax-exempt hospitals, as well as its community health needs assessment, which hospitals have to submit every three years as mandated by the Affordable Care Act. And providers are often not held accountable given the vague framework of the community benefit reporting. The IRS told Modern Healthcare that it cited 388 hospitals out of 1,193 analyzed in fiscal 2017 for issues with their community health needs assessment, financial assistance policies, or billing and collection requirements. But many others fly under the radar, given the staffing cuts the agency has endured, experts said. The IRS reviews each hospital's 990 and community health needs assessment at least once every three years. The hospital's amended documents, which Mount Sinai is currently working on, report around $65 million in net community benefit spending, said Loren Chandler, Sinai Health's chief operating and financial officer, explaining that there was an accounting error. The estimated adjusted Medicaid reimbursement translates to a shortfall of around $40 million, rather than a surplus, according to Mount Sinai. Ernst & Young works with Mount Sinai to submit its 990s, but declined to comment on company-specific matters. Fixing accounting mistakes can be costly, so it's important to review documents closely whether that's done internally or outsourced, experts said. The 990s don't capture the impact of a system like Sinai Health, which is made up of seven legal entities, Chandler said, adding that Sinai's medical group operates at a loss every year. Sinai's Holy Cross Hospital is expanding its critical stabilization unit, which provides 24-hour access for patients experiencing a mental health emergency and helps reduce emergency department visits. It has been a vital resource for an area that has seen a lack of investment in behavioral health services, Chandler said. Results: 91,000 women have gotten mammograms since 2005; 10,000 were flagged; assisted 300 women with cancer treatment. Prior to 2005, 30% of those with abnormal test results did not return for treatment. That's now less than 5%. In addition to the Sinai Urban Health Institute, the Sinai Community Institute offers programs and resources to assist West Side residents at virtually every stage of life, ranging from prenatal care for young expectant mothers to helping prevent elder abuse. “We go out 24/7 to those cases. You'd never see this stuff on a 990,” said Debra Wesley, founder and president of the Sinai Community Institute, which was born about 25 years ago out of Mount Sinai Hospital Medical Center. One of its first programs linked 150 expectant moms with a case manager to help develop a plan for the mother and her baby, extending after childbirth. It drastically reduced infant mortality rates, she said. Wesley got pushback at the time because that “was not the role of the hospital,” she was told. The IRS and hospital associations have gone back and forth on what counts as community benefit. The Catholic Health Association unsuccessfully lobbied for community building activities to be included in a hospital's total community benefit spending (listed on the first page of the Schedule H). As of now, things like physical and environmental improvements and housing and economic development are not included. Hospitals argue that these are inextricably linked to a person's health given, for instance, that a high-school graduate is less likely to go to jail. IRS officials initially contended that those efforts aren't healthcare—a sentiment that runs contrary to the industry's new purported direction. The relatively new narrative component of the Form 990 is intended, in part, to provide a platform for hospitals to make their case for why education and housing is as important as immunizations. Now, the IRS seems on board with that argument, although the agency is reluctant to change the form. In late 2015, the IRS came out with an executive update and clarified that if an activity addresses the social determinants of health and meets the definition of community health improvement, which is included in total community benefit spending, that's where it should be reported. But some hospitals still don't, said Julie Trocchio, senior director of community benefit and continuing care at the Catholic Health Association. “Often it's their legal offices that say: 'No, on page 2 it says housing, so that's where you should put it,' ” she said. Hospitals often forget to list subsidized services, Trocchio said. If a substance abuse treatment center that's losing money has to be subsidized, that can be included in the subsidized services section that contributes to a hospital's bottom line community benefit spending. Another point of contention for the CHA is that restricted grants have to be offset, which means they don't show up on the 990, Trocchio said. If a foundation gave a hospital $10,000 to do an immunization program, a hospital would have to offset the $10,000, so it looks like it spent nothing in the final tally. Volunteer work can also be misleading. Since a hospital doesn't pay volunteers for their time, their work can't be reported on the 990. The Sinai Community Institute administers one of the largest women, infant and children programs in Illinois to ensure that children have access to healthy food. It also has a program that reinforces proper parenting skills, one that provides case management for youth in the juvenile justice system and an after-school teaching program. The organization provides career counseling, occupational internships and training for adults. It helped launch Sweet Beginnings, for instance, which has provided hundreds of jobs while reducing recidivism among formerly incarcerated individuals. Nearly 60% of North Lawndale men have been arrested, booked or charged after the age of 18, according to the Sinai Health Community Survey. Sinai Health is also part of West Side United, a coalition of health systems, public institutions, residents and community groups. Formed in 2017, it aims to spark a recovery on the West Side, where more than half of third-graders fall below the expected reading level. West Side United looks to bolster job training, local hiring and housing development, along with expanding mental health services and increasing access to healthy food. The Sinai Urban Health Institute hosts a gun violence research collaborative that partners with academic institutions, public health organizations, community leaders and health systems to map out the root causes of gun violence. “We need to work together to reduce subsequent incidents,” Homan said. That takes post-acute care coordination, career planning, housing assistance and more, she said. But the 990 doesn't adequately track what a hospital does with a related organization, Trocchio said. The Sinai Urban Health Institute helps fill any linguistic and educational gaps that may be blocking access to care. In one instance, a Sinai community health worker drove a Spanish-speaking woman to get a breast cancer screening. The health worker learned that the woman was afraid that her limited grasp on the English language would put her family in financial jeopardy. “We can't just stop doing these services,” Homan said. It can be hard to measure charity care in dollars when you get beyond uncompensated care, said Joe Lupica, chairman of Newpoint Healthcare Advisors. “The very existence of a hospital is a community benefit, and it's too bad we have to measure things that are essentially ineffable,” he said. Read Modern Healthcare's analysis on inconsistencies and errors in community benefit reporting.